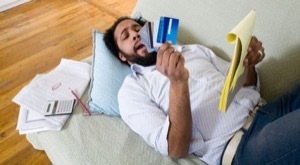 Overwhelming credit card debt is one of the biggest reasons people file for bankruptcy. It is easy to get in over your head before you know it if you have suffered a job loss, drop in income or unexpected emergency. If you find yourself charging necessities every month because you have to use your income to pay credit card payments, the writing is on the wall: you are insolvent and bankruptcy is a real possibility. Credit cards are almost always dischargeable in bankruptcy – they are easy to wipe out. One thing to be aware of, especially if you have made recent purchases on your credit card, is that a credit card company can fight the discharge if they file a case against you for fraud. To win this “adversarial proceeding,” they basically have to prove that you did not intend to pay the credit card charges when you made them. They are careful not to file a case for just any charge. If you only made a few charges for necessities just before filing, especially if you have been making payments, you will probably be fine. They have to hire an attorney, pay a filing fee and get involved in federal litigation to keep you from wiping out your credit card debt. Not only that, if you can show they were not justified in filing the case, you can ask that your attorneys fees be paid. Some of the things the bankruptcy judge would look at to decide whether you made fraudulent charges are how much the charges were, whether you saw a bankruptcy attorney before you made them, how long before filing your case you made them, whether you were making payments, whether they were for luxuries, and whether they were cash advances. Some banks, especially credit unions, “cross collateralize” cars and credit cards. That means they can repossess your car if you file bankruptcy and stop paying the credit card because they have placed a lien on your car. If you have a car loan and a credit card with the same bank, you should make sure the credit card is not cross collateralized. You will not be able to keep your credit cards after filing bankruptcy. Even if you have a zero balance on a card, the company will find out you filed and cancel your account. After you have received your discharge, you can apply for a new card, but it may take time. Bankruptcy will not affect your bank account (unless you owe money to the same bank), so you can keep using your debit card after you file your case. If you are overwhelmed by credit card debt and are thinking about bankruptcy, we want to help you. Call our experienced Seattle, WA lawyers to find out if bankruptcy is right for you.